Joining Tasty Bingo is a great decision for anyone looking for a more interesting online bingo experience. Try out Tasty Bingo today and get your hands on some amazing bonuses and games. It offers the most delectable and satisfying experience you’ll find anywhere. They offer free and cheap games all day, with new bingo site games starting every three minutes! The site launched in March 2010, so their four years of experience are definitely an incentive for both the inexperienced and seasoned gamer. They offer players a unique food-themed site (seriously–where else can you find this?). There are over £1,000 in progressive bingo jackpots each week, available once you make your first deposit, not to mention weekly Bingo and Instant Game tournaments. There are also 100 exciting slot and instant games to choose from, in addition to standard bingo. With so much variety and opportunity, it’s no wonder Tasty Bingo is one of the most popular gaming sites around! 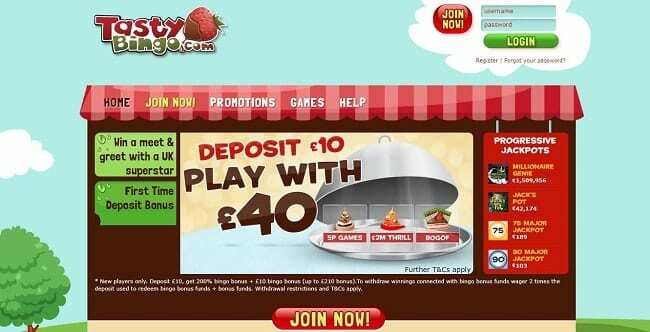 The latest Tasty Bingo promo code allows you to deposit £10 and play with £40. This is a really good welcome bonus which enables you to get much more for your money. See our Bingo Hearts review to see a brand with a similar welcome bonus. As well the promotion available for new players, the site also has plenty of ongoing deals for existing customers to enjoy. If you do carry on using the website, be sure to make the most of these offers when you log into your account. The site is run by the Cassava network and features Dragonfish software, just like many other popular brands. It works pretty well on desktop computers and also translates into mobile software easily too. If you have already exhausted the many similar websites from this brand, you may not see much new here. However we would recommend it to new players, or if you just want to claim the current welcome bonus and try out their game selection. It’s fairly easy to make deposits and withdrawals through these channels. If you are looking for Bingo sites with Bitcoin, there are plenty of these around in the latest releases. The site is also available as an app for Android and iPhone smartphones and iPad and Android tablets. The app is incredibly easy to use and makes gaming on the go a breeze. Mobile bingo sites are becoming more and more popular and this is just one of the many brands which have adopted the portable gaming features. A lot of gaming apps out there don’t offer the same flexibility as their full site, but Tasty Bingo does. It’s just as easy to make a deposit, withdraw, or bankroll as it is on the full site. Whatever you’re in the mood for, this brand will be able to help you out, so don’t hesitate to join! It offers a good choice of games and also the important promo code bonus to use when you sign up. If you found our Tasty Bingo review helpful, why not try out the site for yourself and see what it’s like? You may have found your new favourite online gaming brand.